LifeNets lends support in an unusual way to help those in terminal stage of life. 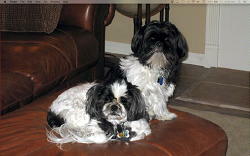 Michelle Mickelson tells this compelling story of special animals giving comfort in a special way. I haven’t written you for awhile, but think of you every time Aimee and I go to the VA. Without your support for Aimee’s certification as a therapy dog, we would not be doing what we do today. 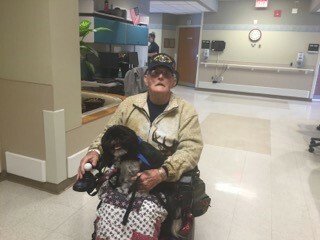 We go at least once a week (on Tuesdays) to the VA, visiting patients in Hospice, Long Term Care and Psych Ward. Aimee knows what day Tuesday is, and is raring to go. I think, as humans, we underestimate what our four-footed friends can comprehend. She has on occasion refused to go into a room that we have frequently visited. I will then make her go in, just to find out the person didn’t want a visit that day . . . how did Aimee know before we even got to the room? I have asked the trainer about this and she informs me that Aimee is smarter than me . . . listen to her. Our weekly routine starts by putting on our uniforms. I have a Logo-T-shirt and Aimee has a Logo-bandana, we then go through the front doors of the Spokane VA Hospital. The minute we walk in there are people greeting Aimee, by name with a big smile. If I am acknowledged (seldom) I am known as “Aimee’s mom". It makes us both feel good that Aimee brings such joy to people in need. We go down the various hallways and peek into the patients’ rooms. So many end up with a great big smile and say they were waiting for our visit. to their day. She is ready to give them a big kiss and converse with them in doggy talk. There are times she just starts talking to certain individuals; I wish I knew what she was telling them. We were once in their room where they can smoke, and she went into a long unpleasant toned dissertation and then left the room. Everyone there commented that she was telling them not to smoke. The men still bring up that it was so funny to be corrected by a dog. When we leave each patient, I have her say good-bye. They really get a kick out of that. Her favorite activity is to ride on their laps in either a wheel chair or motorized chair. They call her a “hood ornament”. They must be moving, or she starts crying. We have spent many a time just going up and down hallways. She also loves to shake hands which I call “give me five”. Pat (in a picture) has a stuffed dog in his room that looks like Aimee and wishes that Aimee could live there with him. His wife recently died, and he loves the love that Aimee gives him. How can I say, what really happens on these visits? Romans 1:20 says to look at creation and you will know who God is. What a unique way to spread this love. When I was out in Spokane for the Ladies Retreat recently – I was able to spend a few extra days in Spokane. During my time there I visited the VA Hospital with Michelle Mickelson and her service dog Aimee!! I thought you might enjoy seeing these pictures – since LifeNets is sponsoring her training. Many of the patients there would light up when Michelle & Aimee would walk into their room. Interacting with the dog was very therapeutic. As the world around us tries to find answers through getting “high” on drugs, alcohol, etc., I have found a way that God even promotes! 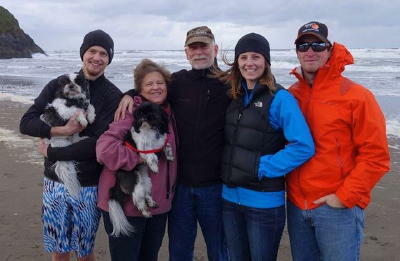 In the first half of 2012, we moved my Dad (Don Goodrich) into the VA Hospice Unit in Spokane, Washington. 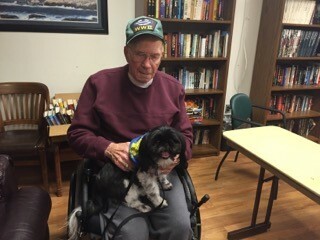 He loved being a part of, what he called his “VA family." The VA is close to our home, so I spent a lot of time there with my father. As he required more care, I would spend more time there. It came down to me and my pair of four-legged friends moving in. 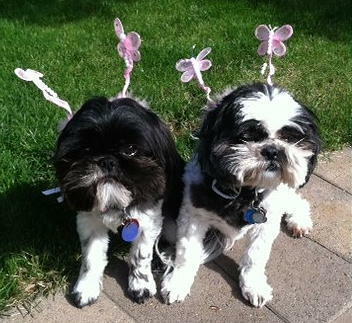 My four-footed friends are Shih-tzu, Mia and Aimee. I got Aimee just as it became necessary to spend most of my time at the hospital with my father. Rex Sexton had found her for me. It was while I was picking up my puppy, and visiting Rex and Patty, that the emergency call came in. My dad had taken a turn for the worse. He had suffered a major heart attack and I needed to return to Spokane as quickly as possible. Aimee (who could fit in my purse) and I flew home. From that point on, I, along with my two buddies, stayed with my dad nearly 24/7. He was very impulsive and would jump out of bed before anyone could get to him. Mia took on the role of caring for my dad and would not leave his side. 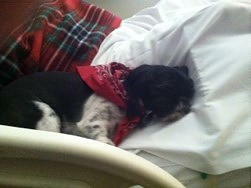 Aimee, on the other hand, would sneak out of his room to go visit staff and patients. He is smiling, it was great medicine for him. 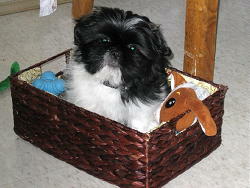 Aimee in her toy box in Dad’s room. My dad died in July of 2012. He had heart issues, but what took his life was jumping out of bed and falling. In turn breaking his hip. After his death, the VA staff asked if we could continue coming. 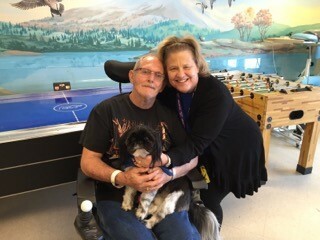 It took awhile to get through the red tape, but Aimee and I have a weekly date, on Tuesday mornings, to go visit the Hospice, Long Term, and Mental Health ward at the VA. If we need a “fix” we will go other times as well. They have also called us to see if we would sit with someone who is dying and has no family. She loves to lay at their feet. I don’t know how Aimee knows that it is Tuesday. She will even wake me up if she thinks I am sleeping in too late. The term “VA” cannot be used in our home. If we do, she gets excited and will not leave me alone. We share the excitement of the “high” we receive by being with these Vets. Aimee has lain with patients, curled up on their beds, in their last days of life. She has played ball with them, and for those who love it, gives them plenty of kisses. She will verbally have discussions with them, one time even telling them that she did not like them smoking. I wish I had a video of her giving this long disgusting talk and then leaving the room in which they are allowed to smoke. They all laughed and agreed that she felt they shouldn’t be smoking. We have had patients, who say they would give us a million dollars (if they had it) for sharing Aimee with them. One counselor couldn’t believe it when a young Vet opened up and played and talked with Aimee. We actually come home on “a high” and want to share our experiences with Mark. The latest one, was when she ran down the hall to the lounge in the mental health ward, expecting to see all her friends. No one was there. She was truly distraught and sad. Aimee has never had any formal training or certification. Since the VA has known her since she was a puppy, they gave Aimee her own personal certification. I still wanted to have her certified, so no one could ever question her being at the VA and so I could take her to other places as well. I looked into what it would take, and could not afford it. I know it was because of God, promoting getting this “natural high”, that I ran into a trainer, who would do it for half price, since we were serving Vets. I then went home, and my husband, Mark, recommended I call Beverly Kubik to see what the steps would be to apply for LifeNets support. I couldn’t believe it when she called me back within five minutes, and said “go for it.” Aimee will, in a few weeks, have her “Canine Good Citizenship” certification. The Vets were a little concerned that if she took classes, she would not be Aimee anymore. I reassured them that she would still give them plenty of love. It will take her 8 weeks to get through the program and I can tell she is trying very hard to learn. Her problem is she gets so excited about doing a task, like “sit – stay”, that she gets up and dances in excitement! It amazes me that a dog (and I) could get so much out of serving others! 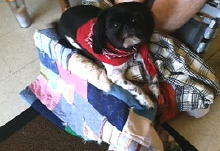 If a four-footed creature of God’s, without God’s Holy Spirit, could get so much joy from serving, how much more can we? It doesn’t take any special skill or talent. It only takes giving of your time and love to someone in need. How about going out and getting a “natural high”? It’s not illegal, you don’t have to go to rehab, and God totally promotes it and will bless your efforts. THANK YOU LIFENETS, FOR YOUR SUPPORT! Because of HIPPA laws, I am unable to have any pictures of the patients.